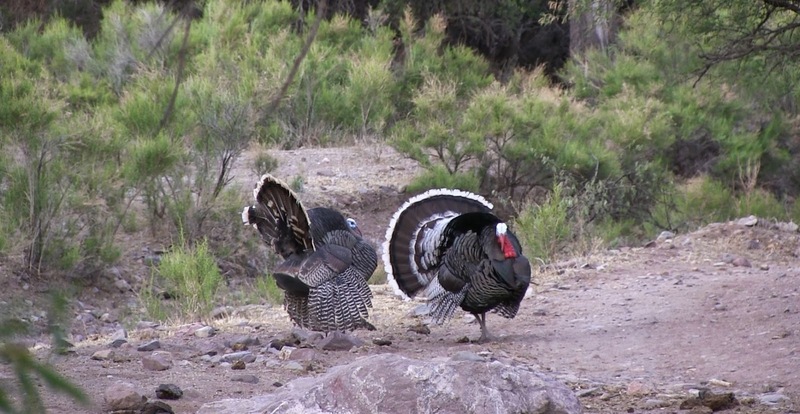 We are now booking for the 2017 Spring Mexico Gould's Turkey Hunt Season. 2016 season is about to begin! Check back for our results. 2015 was a great season with 16 gobblers harvested and several Royal and World Slams completed (see the 2015 highlight video below). We had an awesome 2014 Gould's Turkey Hunt season with 10 hunters harvesting 15 birds and several Royal Slams were completed. Click to see the 2014 Gould's Turkey Hunt Photo Album and the 2013 Season Photo Album. Check out the video below of the Bucket List TV Show that was filmed with us and 2014 highlights of our great turkey hunting season. 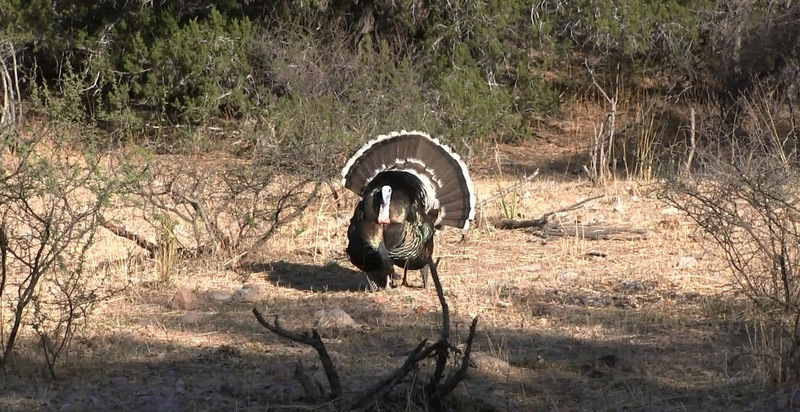 If you would like to go Gould's Turkey hunting in the spring of 2017 send me an email at jayscottoutdoors@gmail.com or call at 602-803-0223. We hope to share a camp with you and help you get your Gould's Turkey! 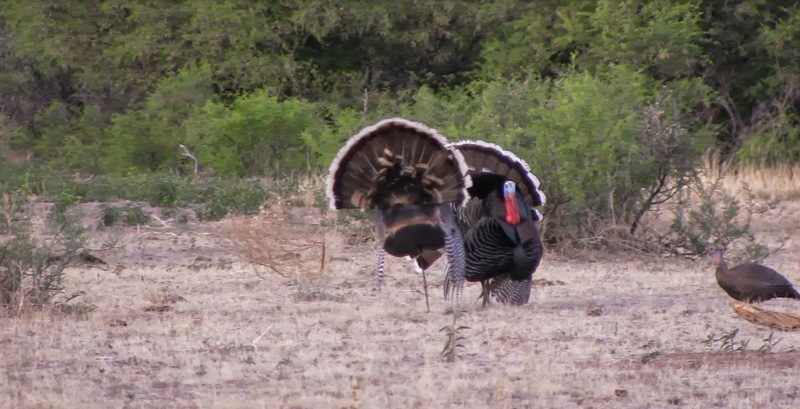 E12-Goulds Turkey from Muddy Boot Productions on Vimeo. Mike Jones went with Nicole and Brian on a last minute invite and was able to harvest two big Gould's gobblers with his bow. They killed four birds with bows in 2 days. The video below is Mike's second bird with Brian running the camera. Ed Drummond killed his first Gould's turkey on the first afternoon we arrived at the ranch. Then on the second morning of the hunt was able to watch his cousin Bryan harvest his Gould's turkey which completed Bryan's World Turkey Slam! Congrats Bryan and Ed! Nicole and Brian Rimsza hunted one of GouldsTurkeyHunt.com's properties on a self guided trip this year with their friend Mike Jones and had a great hunt. Nicole harvested two Gould's gobblers with her bow. One had over 1.25" spurs! Mike also harvested two birds with his bow and arrow. See Nicole's video of her big Gould's below the photos. Photos courtesy of Brian and Nicole. We had a awesome time hunting Gould's turkeys with husband and wife, Bob and Carole, from Paradise Valley. Bob was able to harvest his turkey on the first afternoon with his bow by shooting the bird just above the waddles with a magnus bullhead broadhead. After the shot the bird basically didn't know what happened and kept beating on the DSD jake decoy. See the video below. Carole doubled on two beautiful Gould's turkeys the next afternoon. See her hunt video below as well.